The Havit HV-MS735 is one of the best cheap gaming mice on the market. So good it’s even sold out on Amazon. But keep your eye out for Havit to restock the HV-MS735 because its one of the best mice I’ve tested thus far. 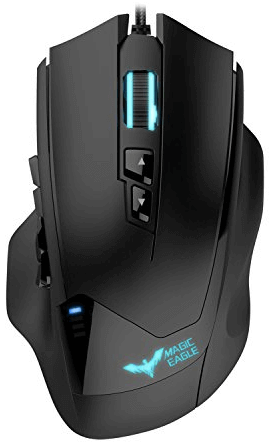 This is a mouse built for gamers with a DPI that ranges up to 12000 with 7 different settings. We’ve talked a lot about DPI settings in our reviews and if you’re still unsure of what it exactly means for gameplay then all you need to know is that it measures sensitivity. The higher the DPI then the farther the cursor will travel when you move your mouse on the pad. If you’re a gamer who likes to make really small movements then you’re going to love a high DPI, but you’ve got to be extremely precise to do this and it takes some practice. Hence, the reason I’ve stressed that very few gamers need a DPI as high as 12000, but there are gamers looking for DPIs in this range so don’t write the Havit off just quite yet. It’s always nice to have the option as you advance and refine your gaming skills. Though its 500 Hz polling rate isn’t quite as high as other mice in this price range it has 50 G acceleration, which puts the gamer in complete control of virtual performance. The 19 programmable buttons are a shock to all gamers. It doesn’t get much better than that as far as settings go. But you’ve got to be a serious gamer to utilize all of these buttons and I did find that some of them got in the way of gameplay if you’re not fully acclimated to the ergonomics. But with some practice, it became easier to get familiar with all the design of the mouse. To help you recognize the DPI settings the mouse has dedicated colors for each. There’s an astounding total of 16 million color options actually with a breathing light as well. The ergonomic right handed design may not work for you left handers but for the most part, I think Havit did an excellent job at creating a diverse mouse with some awesome features. It has a nice mixture of design capabilities as well as specific gaming features to potentiate virtual performance. The 1.8m braided fiber cable comes with a gold-plated USB connector to ensure a quality connection. The cable is neither too short nor too long and it’s an easy compatible device to carry along with you or keep at home. The software took less than 5 minutes to install and was a breeze to navigate. The software gives you the ability to program your 19 buttons as well as your DPI settings. I found that the interface was a really smooth and clean one with a straightforward design. The mouse is a plug-and-play with a driver that comes with it to enhance programmability. The sensor isn’t fantastic but it works. The Havit uses an optical sensor and I experienced no jitter during my three hours of playing COD. The tracking was flawless even during gameplay at extremely fast speeds across the mouse pad, which is a nice benefit of the Havit’s 50 G acceleration rate and the sensor combination. You see friends, the best gaming mice aren’t necessarily good because of having the top quality specs in all aspects, but rather, specs and features that work together in combination to create a gaming mouse that functions as a whole. That’s what matters in the end so when you’re reading the specifications of a mouse don’t get too caught up in the technical stuff. It’s the way it performs that matters most. The build is a medium size and shaped well for my average sized hand. I found no problems with sweat and dirt accumulating on the mouse over a two-hour stretch on an 80 degree day. My gaming style calls for claw and finger and this mouse is really well suited for it too. But if you prefer to palm your mouse then the Havit’s ergonomic design is well-suited to your needs as well. To test the diversity of the ergonomics I had a friend, who loves to palm his mice, test the mouse out and he had no complaints. The texture is a matte finish, which also meets my ergonomic standards. Although some gamers out there might find a plastic finish to be too slippery, over several years of testing hundreds of gaming mice I prefer the matte finish over a rubber one. The buttons felt amazing, they were responsive and tactile. Each button has a good amount of resistance to deter any potential accidental clicks. Overall, Havit has designed a well-rounded mouse with even better features than that of its competitors. Both its design and functionality make it a top pick for professional gamers. 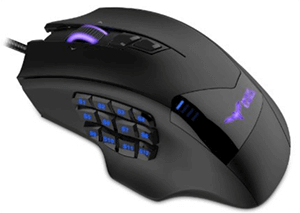 I’ve spoken to two friends who play World of Warcraft professionally and they referenced the mouse when I asked what they prefer to use in professional matches. So if you’re looking for a gaming mouse that can provide you the room to grow as a gamer then I’d check out the Havit . 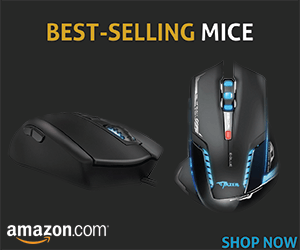 If you’re not as serious of a gamer and just play for recreational purposes, then you might save some money by buying a mouse with fewer features. Could you also review the Redragon M901 and talk about each one and which one is better over all, thanks. 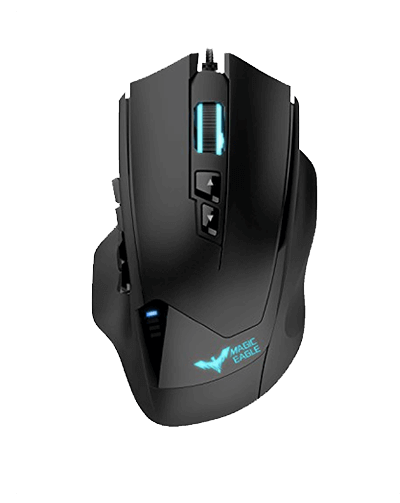 You can read the review of Redragon M901 on MouseArea!